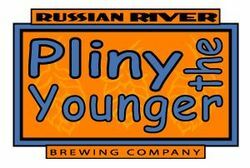 Each February, Russian River Brewing Company in Santa Rosa, California releases Pliny The Younger, a limited-release triple IPA that is probably the biggest cult beer in the world. Rated 100 out of 100 on RateBeer.com and currently placed as the #2 best beer in the world on BeerAdvocate , plenty of interest has gathered around Pliny The Younger’s release each year, motivating long-distance travel plans for a few of us extra-special beer geeks and just the willingness to stand in long lines for the rest of us “average” hopheads. Although I have visited RRBC and frequently sip beers like Damnation strong golden ale and Pliny The Elder (double IPA), I have never made the necessary effort to get my hands on a glass of Pliny The Younger. I figured I can always get a pint of Pliny The Elder or any one of literally dozens of IPAs or Double IPAs from local San Diego breweries to satisfy my bitterness cravings. But this year was going to be different…I was not going to let the 2013 Pliny season pass without this rare assembly of hops and barley passing my lips. Being the craft beer capital of America, we San Diegans are lucky to have several craft beer bars that will be carrying Pliny The Younger (dates and quantities will vary, as do prices, I discovered). 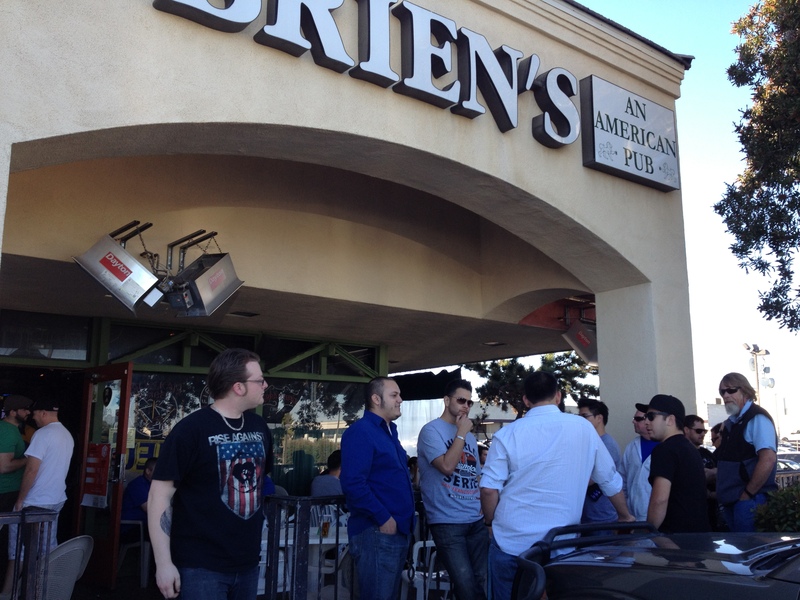 Since O’Brien’s pub is located about a stone throw’s from my place and probably has as close a relationship with RRBC owner/brewer Vinnie Cilurzo as I can imagine, I knew this would be the spot to go to. I got the heads up that they would be tapping PtY this past Saturday, and made plans way ahead of time to be there. 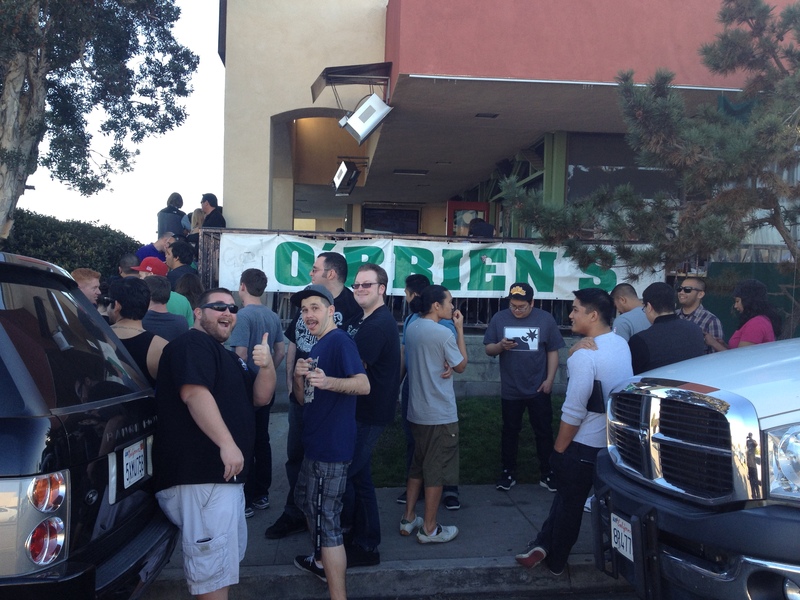 The line at O’Brien’s started forming about an hour and forty minutes before tap time, and quickly increased to wrap around the block outside the Kearny Mesa strip mall. I was well within the first 30-35 people in line (well, I had to polish off my Bear Republic Racer 5 IPA inside the bar first…), so wasn’t worried about being left out on my fill. The line was filled with opinionated craft beer enthusiasts, so there was plenty of opportunity for idle chatter about one of our favorite topics…sure beats standing in line for the Matterhorn at Disneyland and trying to talk to the people in front of you about whatever changes were made to the ice monster a decade ago! 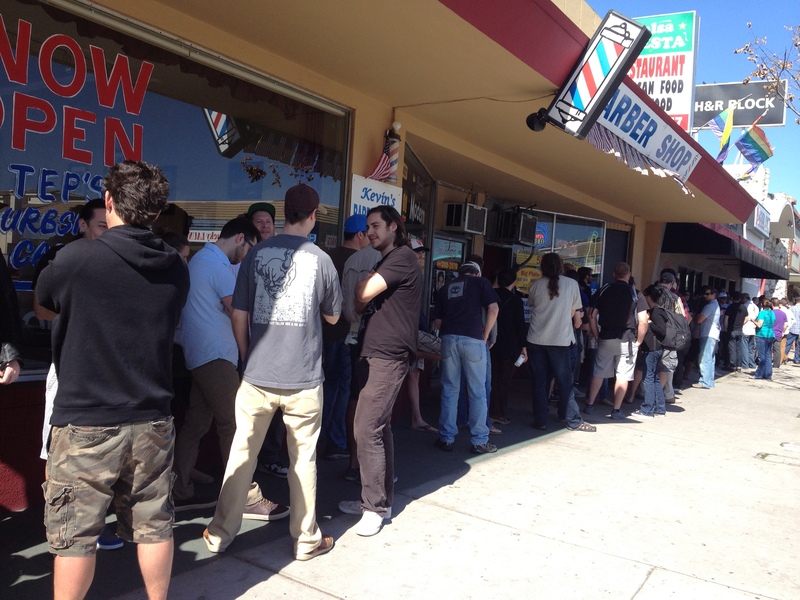 I checked in with a few of my fellow hops addicts in line for the promised fix of Pliny The Younger, to ask them both about the hype and the beer itself. 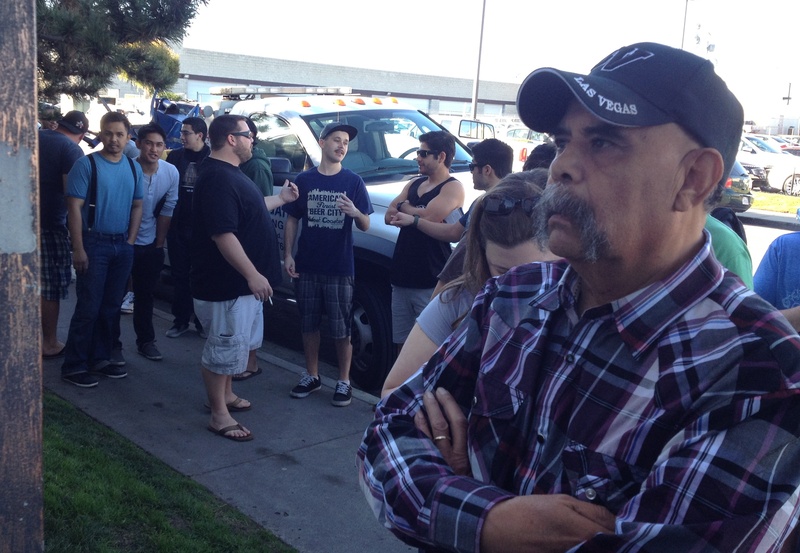 Jonathan Diaz was at the head of the line, determined to get his taste before anyone else. 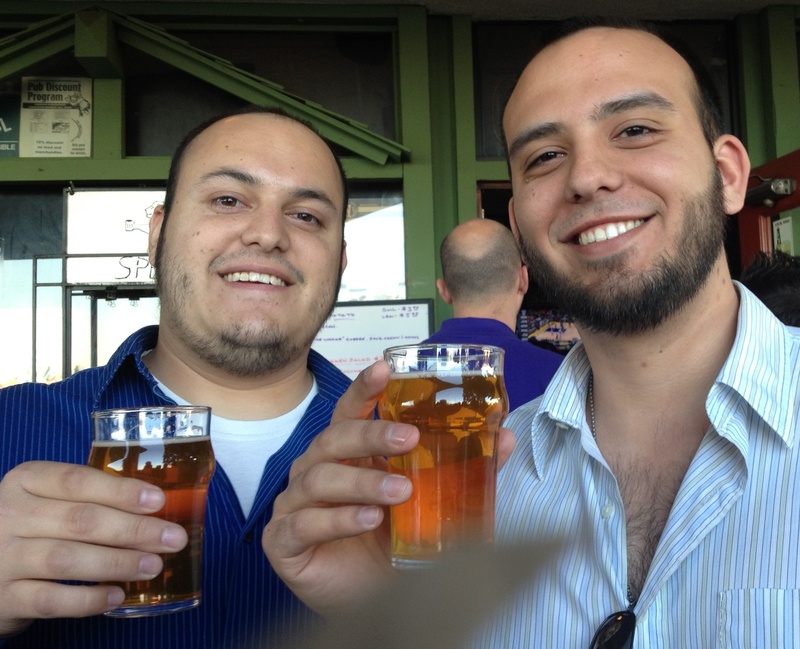 V&S: Have you had this beer before? Diaz: Nope, never had it before. V&S: What are you expecting out of Pliny The Younger? V&S: What would you rate it on a scale of 1 to 100? Rob Binkley waxed philosophically about balance. “There’s four ingredients of beer, and pretty much the same four ingredients make every single type of beer. It’s the ratios that make beers interesting, tasty, beautiful, and different. And if you think of really hoppy beer, Pliny has one of the best balances with hops in it, it’s like GREAT… not too strong…, well it is pretty strong, but it’s hops that’s not overly bitter, not overly controlling, it’s just a great…smooth…pretty much the greatest beer ever!!! All right, so there you have it…it’s apparent that many Pliny fans do not understand the limits of a scale ending at a mere 100. That’s just a small sampling of semi-organized thought about this beer that in just the past few years has become an obsession among craft beer drinkers whose tastes are geared toward the same end of the beer spectrum as myself (that is to say, hop-heavy American Pale Ales, India Pale Ales and Double/Imperial IPAs ranging from the bitter to the extreme bitter). But is Pliny The Younger all hype? What’s the deal? I was about to find out as it was nearing tap-time. As tastings began, O’Brien’s skilled servers processed pours in an efficient “Soup Nazi” style….fork over your cash, hit the tip jar, grab your glass and step aside for the next guy in line! So I finally got my taste on…Like a lot of freshly brewed and poured IPAs, Pliny the Younger has a fresh and citrusy aroma. On first taste, you get pleasant hoppy bite on the mid-palate, but it was definitely not as astringent as many other “triple” IPAs and hop-bombs that I have tried; as aforementioned, this is an extremely well-balanced beer for the insane amount of hops that go into the recipe and being nearly 11% in alcohol (I think I was told this year’s batch was 10.8%); it tastes more like a 7% IPA. There was some fresh evergreen oil (yes, Pliny is piney), and some orange rind in the flavor profile. The finish was clean, and left some lingering hops bitterness…afterglow for beer geeks! 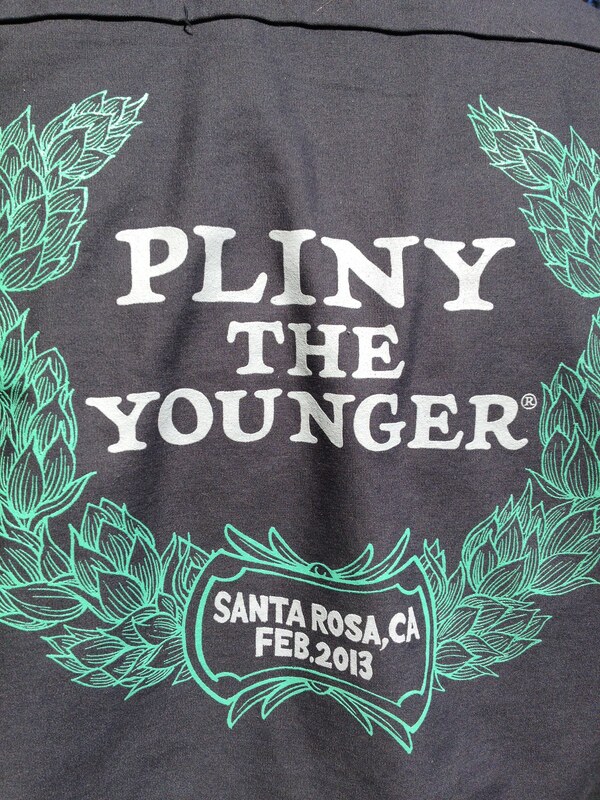 So how do I rank Pliny The Younger? I will give it a 96. It is an excellent beer that hits the spot for me with the qualities that I often look for in a beer. 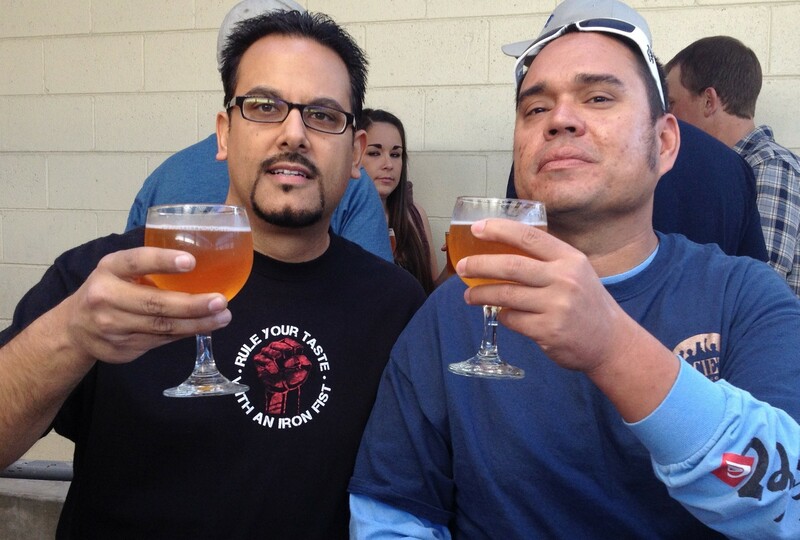 However, as a spoiled San Diegan craft beer drinker, I also know there are several other local beers that hit that same spot for me. This is something I pondered over a glass of The Roustabout double IPA at nearby Societe Brewing Company an hour later. 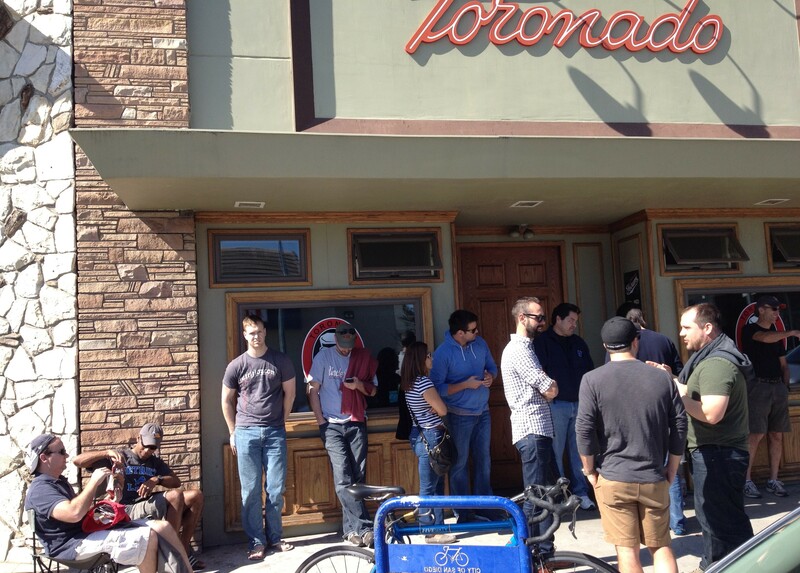 I wouldn’t often think of standing in long lines and spending the kind of money that bars are charging for a small glass of Pliny, but this is once a year…and an opportunity for IPA enthusiasts from all over to meet and celebrate something special. 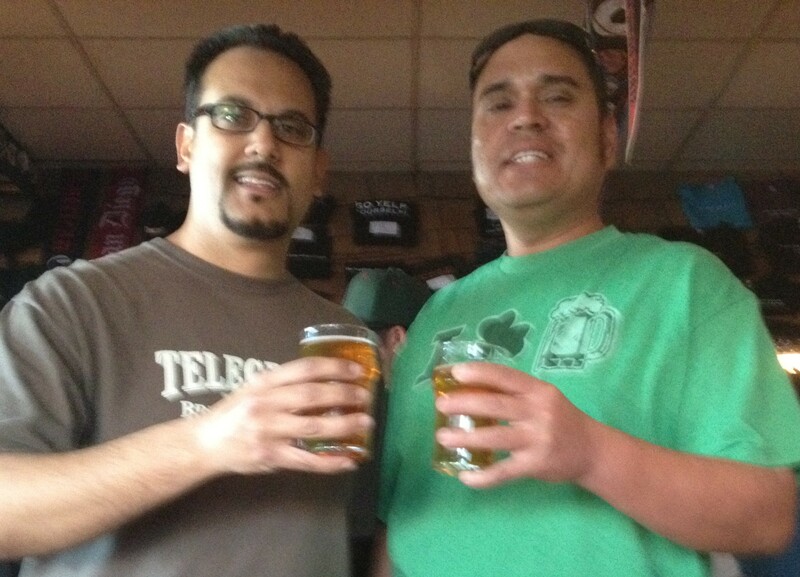 And so the very next day I found myself doing it all over again, this time at Toronado in North Park. Why not?! 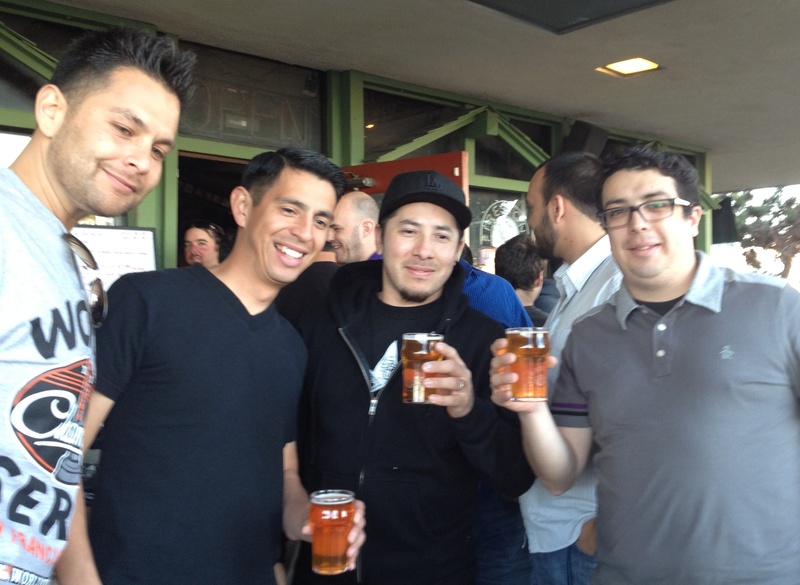 Posted on March 16, 2013, in Bars, Beer, Breweries, Brewing Company, Events, IPA, Russian River Valley, San Diego, Tasting and tagged Alpine Brewing, Ballast Point, Bear Republic, Beer Advocate, Belching Beaver, Coronado Brewing, craft beer, Double IPA, Exponential Hoppiness, Green Flash Brewing, Hess Brewing, imperial IPA, Iron Fist, Kearny Mesa, Latitude 33, North Park, O'Brien's, Pizza Port, Pliny The Elder, Pliny The Younger, RateBeer.com, RRBC, Russian River Brewing Company, San Diego, San Diego beer, Sculpin IPA, Societe, Stone IPA, Telegraph Brewing Company, Toronado, Triple IPA, Vinnie Cilurzo. Bookmark the permalink. Leave a comment.